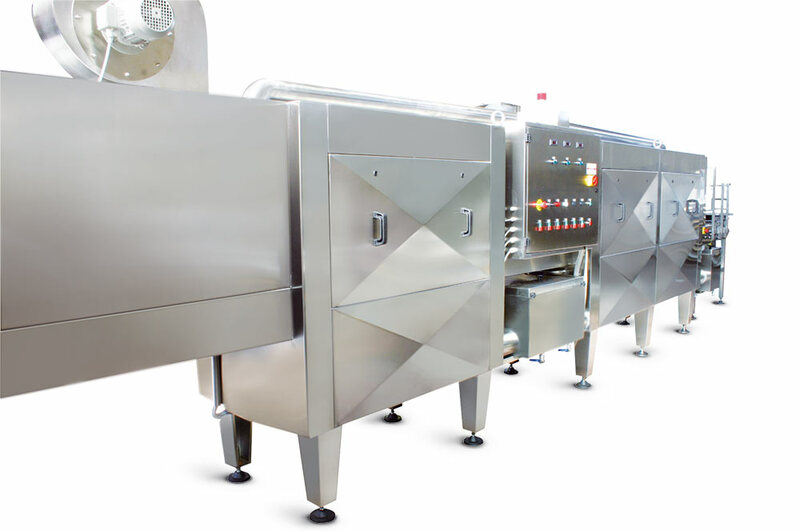 This machine is completely made of Aisi 304 stainless steel. 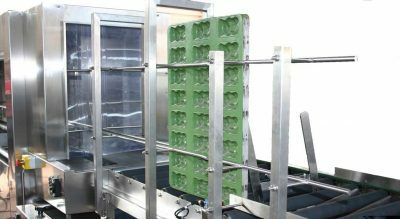 It can be inserted in an automatic line for pan and box conveying or it can be used independently. The electric control box is equipped with Touch Screen for working data management and programme storing. 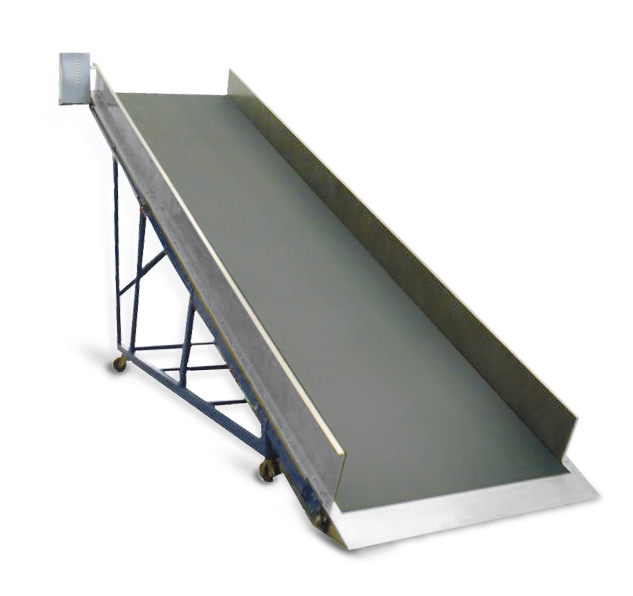 This machine can be used both for horizontal and vertical washings. Max. recommended speed is 18m/min. The washing system works with disposable water but makes use of overflow levels in the various chambers to reduce water consumption. First chamber: pre-washing with warmed water, the system is equipped with electropump with adjustable pressure on the nozzles. Second chamber: washing with warmed water, the system is equipped with electropump with adjustable pressure on the nozzles. Third chamber: rinsing with cold water, the system is equipped with electropump with adjustable pressure on the nozzles. Fourth chamber: dripping by means of electric fans. The ribbon built in steel inox Aisi 304 or Fe painted complete of motor and reduction gear, realization of the project according to in demand of the client. 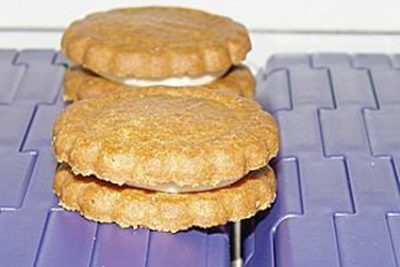 Speed of the adjustable ribbon through inverter. Realization of the ribbon also with inclination of around 20-30° with an initial rectilinear line. Possibility of slide also on pen. Ribbon built in steel inox Aisi 304 or painted Fe. Complete of motor and reduction. The ribbon is climbed on on revolving wheels with brake and it is completely washable with water in pressure. Realization of the project according to in demand of the client with safety devices to rope and mushroom with inclination of around 20°C. 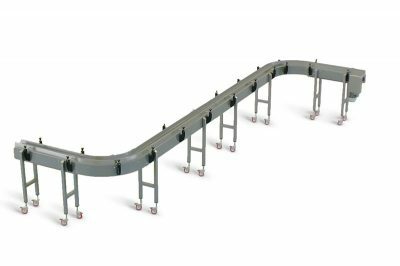 With the new technology of construction of the modular ribbons, the Scame is realizing some modular conveyors to pen, setting so a second constructive choice when the client has the necessity to transport products of small dimensions. 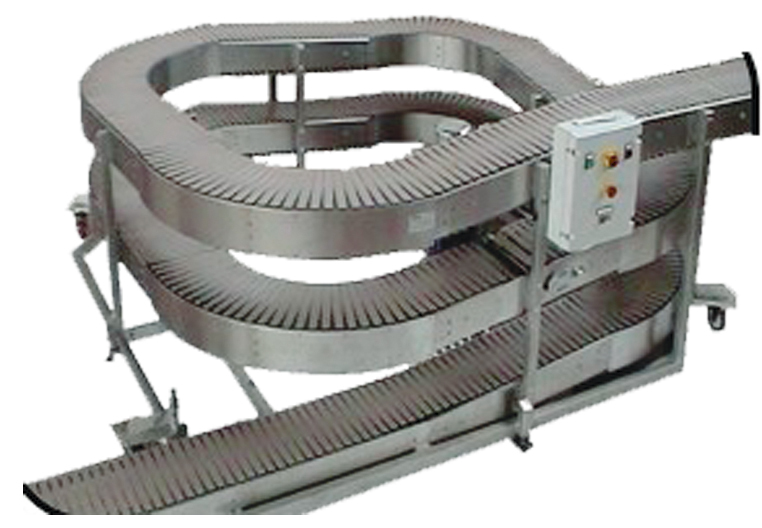 Ribbons modular conveyors in plastics use ribbons formed by forms in plastics, united by zipper pivots and operated by pinions in plastics. 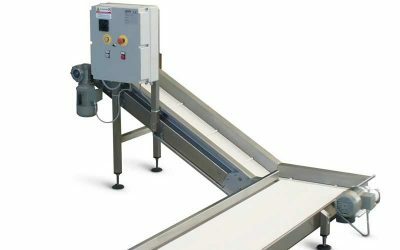 Among the characteristics that distinguish these conveyors they detach the maximum sturdiness of the materials and models, the good resistance to the corrosion, the system of drawing to pinions, low coefficients of attrition and resistance to the abrasion. The modular ribbons are equipped with easy jerky pivots by to get off: don’t ask for some utensil I specify. 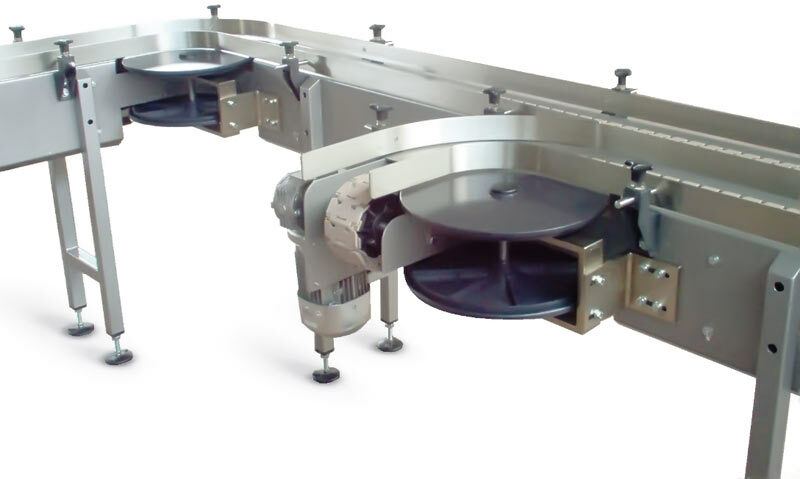 For the maintenance, the pivots can be removed and therefore reinstallati, paying the maximum attention to avoid damages to the head, to the collar or to the sweater of the ribbon. Aisi 304 stainless steel belt with two gearmotors. Max. recommended speed is 10 m/min. 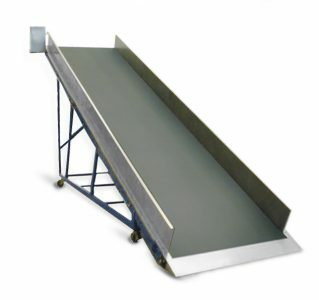 Belt slats can be made of plastic or of stainless steel. Project realization according to the customer’s requirements. Aisi 304 stainless steel belt. Equipped with motor and reduction unit. The belt is assembled on castor wheels with brake and is completely washable with pressurised water. Project realization according to the customer’s requirements. Max. recommended speed is 30 m/min. Bend radius of the slats is 250 mm. Project realization according to the customer’s requirements. 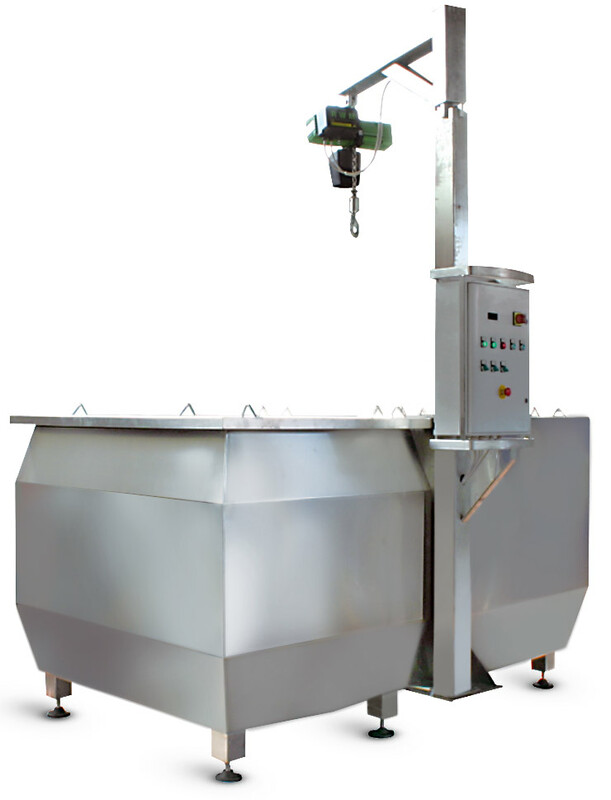 This machine is completely made of Aisi 304 stainless steel. The two baskets have a capacity of 1m³ each. Water is warmed by means of an electric-controlled worm-pipe which is monitored by a temperature controller. Inside the two baskets n.2 inverter-controlled electroagitators with dynamic balanced marine screw propeller are installed. The tanks are equipped with n.3 baskets/trolleys on wheels for the deposit of the material to be cleaned. 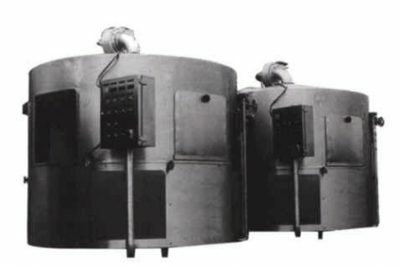 The first tank is used for washing, the second one for rinsing. 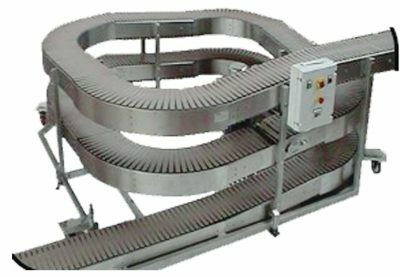 The machine is equipped with an electric cantilever arm to lift baskets/trolleys and put them inside the washing tanks.